While there are countless positive experiences that can come from being born into a migrant family living in the diaspora, there are some downfalls, one being the distance to loved ones. Many young Greek Australians missed out on meeting their pappou and yiayia, let alone having the privilege of spending holidays with them, or better yet, countless hours passing the time talking, learning, laughing, and crying – all, more often than not, while eating the food they learnt to cook from generation-old recipes. Korina Anthea Lew was one of the lucky ones. Born and raised in Melbourne’s east, some of her earliest and, no doubt, fondest memories are those spent with her yiayia Argyroula Theodoropoulos was born in the village of Pidima in Kalamata, Greece in 1927. She arrived in Fremantle, Perth in 1954 and settled in Melbourne two years later, where she went on to have her own family, raising four children and became a proud grandmother to five, one of whom was Korina. In Melbourne, Argyroula, like many migrants, set out to recreate elements of village-life. “Nothing could beat freshly grown produce nurtured by yiayia. Her garden was truly her pride and joy,” Korina recalls. Sleeping at her yiayia‘s house, always felt like an adventure. They had a weekly ritual; Korina would stay over on Tuesday evenings to wake up early on Wednesday when they would stop by the local Greek Club to socialise, and play bingo. “Somehow I would always end up with the wining prize of chocolates!” Korina remembers fondly. They would then make their way to Box Hill Central, where together they would do the weekly grocery run at the Greek Deli. There, Korina would observe her yiayia meticulously picking and gathering ingredients for her meals, stopping midway to proudly introduce her granddaughter to the suppliers. Even when life got busier for Korina years later, studying five minutes away from her yiayia, she would make the time to pop in. No matter the day or time, yiayia Argyroula would without doubt be up preparing a kafedaki, with a tasty meal at the ready. “To follow our tradition, I would regularly chauffeur her to the Greek Club and continued our shopping routine. During these times we built an unbreakable bond and truly were best friends,” she says. Korina’s beloved yiayia has since passed away. But it is these memories, and her early exposure to ingredients, and the love and care that go into preparing food for loved ones, that ensure Argyroula’s memory is kept alive. 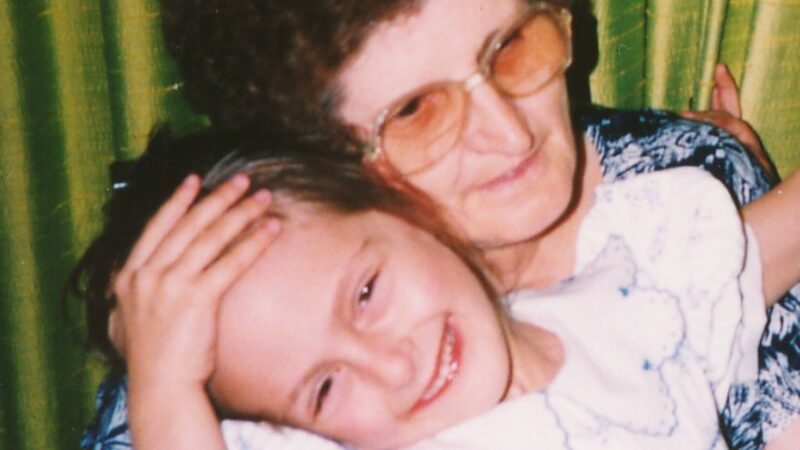 “I would often find myself in my yiayia’s kitchen – I was always drawn there,” says Korina. “I developed a love of cooking from years of watching her cook; I would take note as she measured the quantities by sight and feel. Korina has generously shared one of her favourite, and most memorable recipes, handed down from yiayia Argyroula for you to try your hand at, at home. “This recipe is home to me – as are many of my yiayia‘s recipes,” says Korina. 2. Clean out peppers and tomatoes, reserving the inside of the tomatoes. 3. Finely dice onions and garlic. Saute in 1/2 cup of olive oil for 5 to 7 minutes, or until transparent. 5. Chop reserved tomato insides and add to pan with canned crushed tomatoes and sugar. Cook for 2 minutes. 6. Stir through parsley, dill and mint. 7. Lastly add the rice, salt and pepper. 8. Take off heat and allow to cool to room temperature. 9. Fill capsicums and tomatoes 3/4 full and place in baking dish. 10. Fill baking dish half way with boiling water. 11. Add the remainder 1/2 cup of olive oil over the vegetables. 12. Place in oven and cook for 90 minutes or until rice is to your liking. Best served with feta and crusty bread.